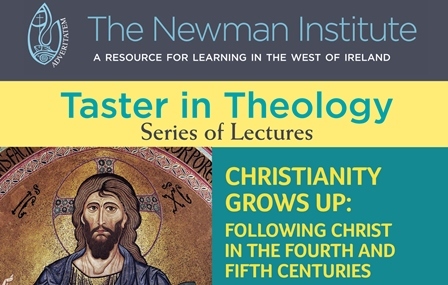 The Newman Institute invites you to a three week Taster in Theology Series of Lectures on Church History with Professor Salvador Ryan. The fourth and fifth centuries were a time of enormous change and development for the Christian Church. In these centuries it was called upon to clarify precisely what it meant to believe in the Trinity, and how it could be claimed that Jesus Christ was really both fully human and fully divine. It also had to deal with the growing pains of moving from life as a dis-privileged religious sect to being the official religion of the Roman Empire. This would not be an easy transition. This short course invites participants on a fascinating journey through two of the most formative centuries in the history of Christianity, where they will meet a remarkable cast of characters: saints and sinners, heroes and villains. And, intriguingly, sometimes history has changed its assessment of “who’s who”. The course will be conducted in a relaxed manner with lots of time for discussion. Salvador Ryan is professor of Ecclesiastical History at St Patrick’s College, Maynooth. He has taught courses on early Christianity for many years, and has published widely in the area of popular religious culture in the Middle Ages and early modern periods. Recent publications include The Cultural Reception of the Bible: Explorations in Theology, Literature and the Arts (Dublin: Four Courts Press, 2018) and Marriage and the Irish: a Miscellany (Dublin: Wordwell Press, 2019).